Recent batch of stuff that I painted all black. Most of these have already sold at Stars. Still playing ‘catch up’ on posts from time lost from that recent bee sting. (how long can I milk THAT excuse?!?!?) but seriously . . . 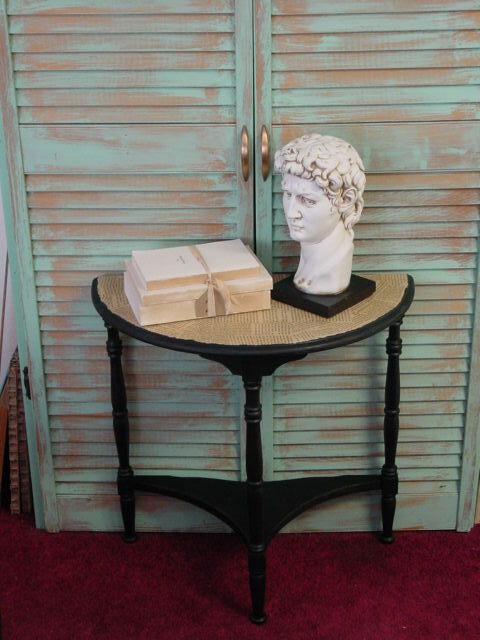 This big old pedestal came from a rummage sale in the summer. It was originally medium brown. Sanded it a bit, spray painted it black and sanded the edges to distress a bit. Michael scrounged the round that I used for the top. Now to find a top! Michael ‘scrounges’ for a lot of the plywood we use to make stuff; and the place he gets the plywood frequently has big ’rounds’ of plywood. Perfect for making a table. Just add legs! These tops however, are UNfinished. So I have to be sure I can match the finish I creat on the top to the finish on the legs. 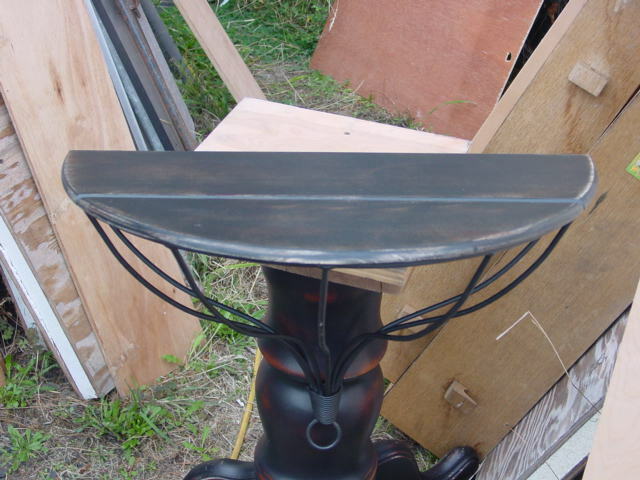 Since this top was unfinished (AND had a big HOLE in the middle; which we filled with a dowel and some wood putty) I painted it with the flat black spray paint first. Then sanded so that some of the raw wood showed through. 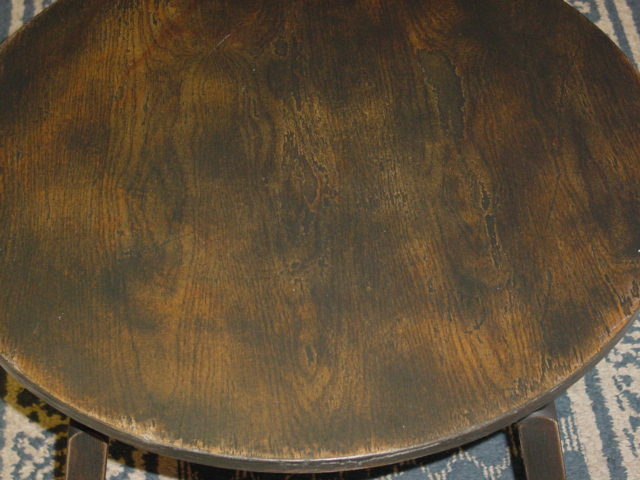 Then wiped on some dark wood stain, which only shows on ‘the sanded through the black paint’ parts. Let the stain dry overnight and apply a couple coats of matte varnish. This lighting (took pic at Stars) is better for seeing how closely I was able to match the top finish to that of the base. 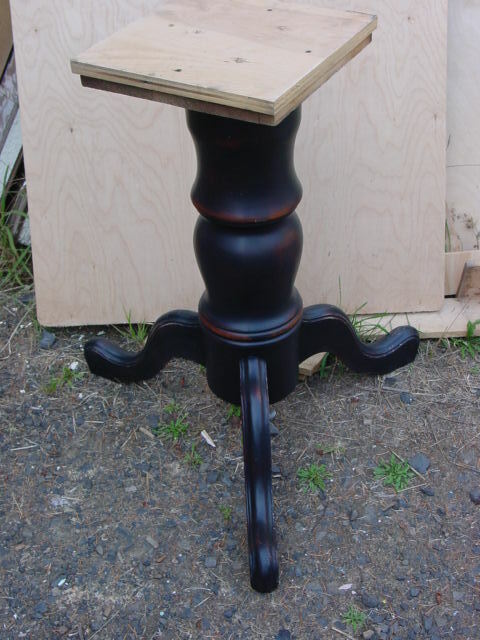 A cute little wood side table stained a medium brown(I think this is the ONLY before picture I have of the stuff I painted black!) Sand first to prep the wood. 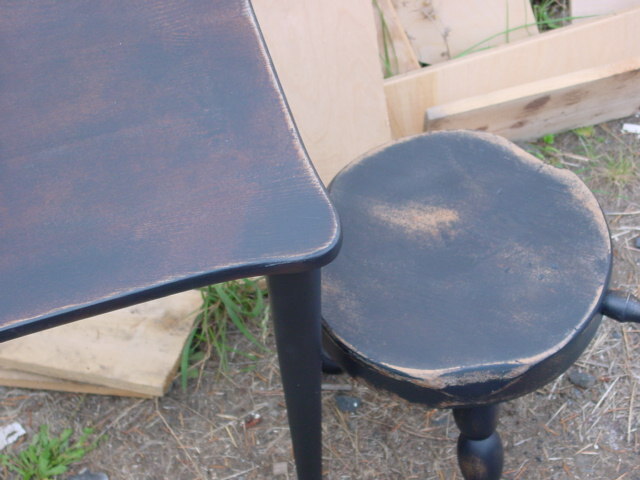 Quick couple of coats of flat black spray paint, (the CHEAP $.99/can stuff at Home Depot!) sand, varnish, DONE! 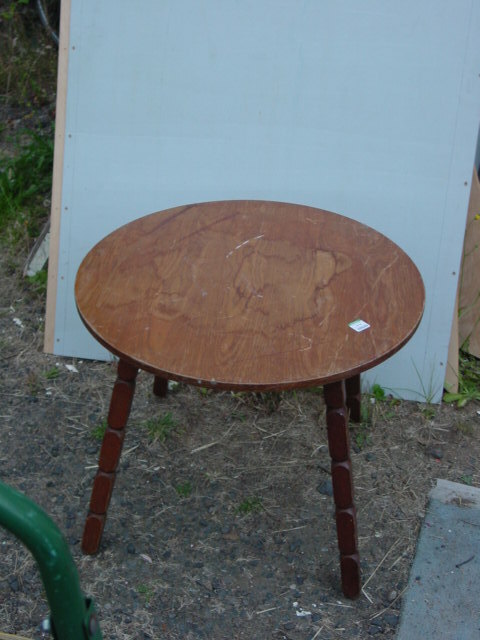 Did the same with the little milking stool in the pic below. 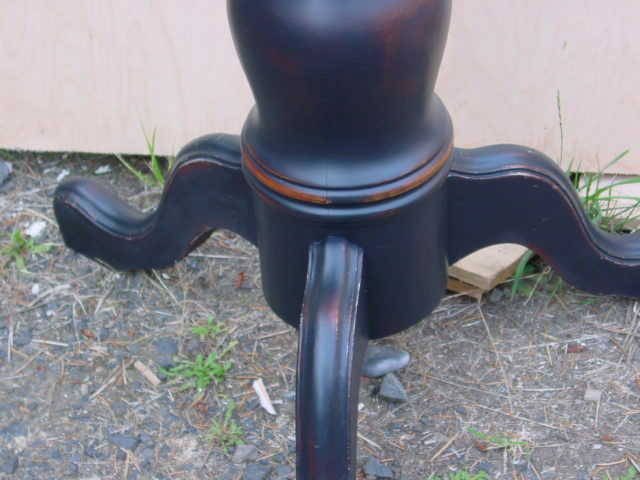 It’s actually become a ‘tradition of sorts’ for me to paint a big batch of black furniture this time of year. I’ll save up lots of dark stained items here and there throughout the spring/summer garage/rummage sale season; specifically to paint black in the fall. For some reason, this is the only time of year that I LIKE to paint things black. And because the weather is so iffy this time of year; being able to quickly spray paint a whole bunch of stuff all at once is a real necessity. 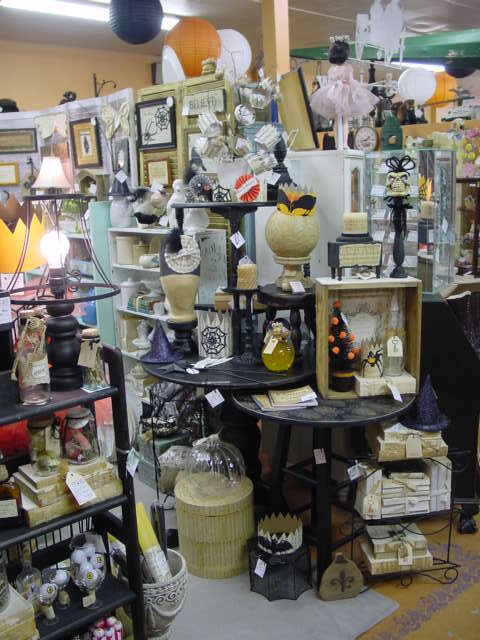 This oversized wall sconce/shelf had a black wrought iron bracket and stained wood shelf. Again, just sanded and quickly spray painted the wood shelf part; sanded again to distress and slapped on a quick coat of matte varnish. DONE! This one is a variation on the theme. It was originally GREEN (a very YUCKY green at that!) and the top was too damaged to sand smoothly. (which is probably why it was priced so CHEAP!!) So, no sanding to distress on this one. Don’t want to show off that ugly green undercoat! 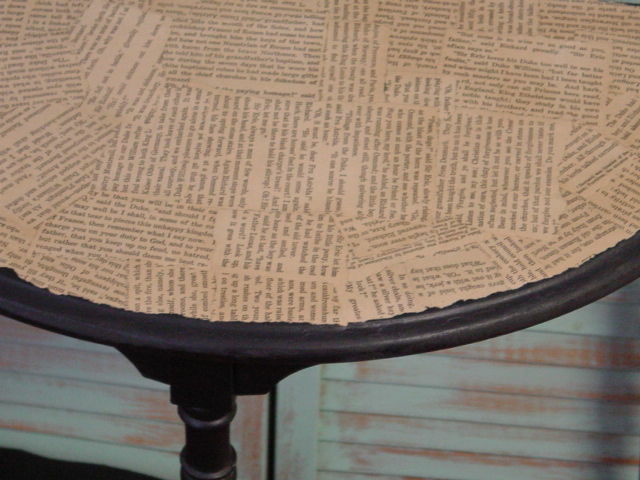 But I did still use the flat black spray paint, and then I used torn up pieces of old book pages to cover the top. Dip your paper in liquid laundry starch* and place on the table. Let dry overnight. Add a coat of matte varnish. * If you can’t find liquid starch, you can use watered down Elmer’s glue or decoupage medium. 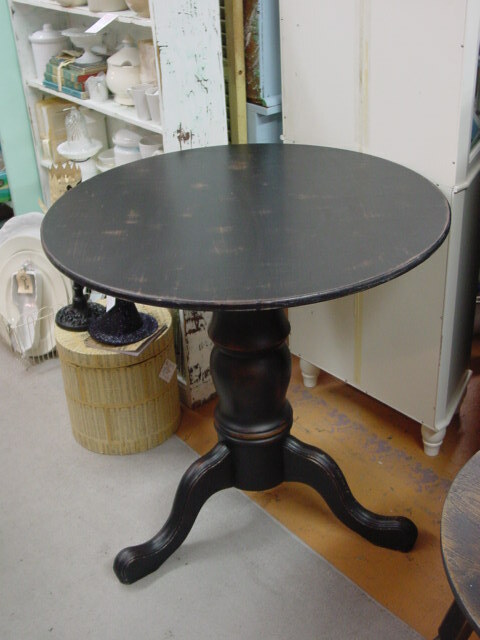 These little ‘half tables’ always sell really well for me. 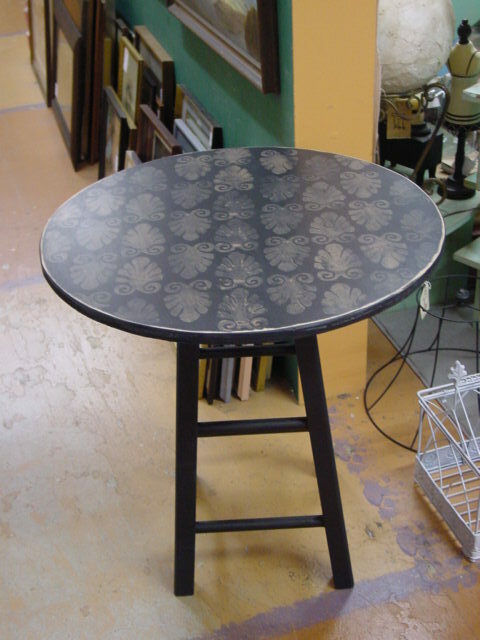 This table is one we picked up on our daycation to the coast. Pretty bad top, but the legs were in good shape. Tops are EASY to sand and/or cover up; so there is seldom a damaged TOP that will deter me from buying something. The LEGS however, would take a LOT of work to fix up if they were damaged. Damaged legs are usually not worth bothering with. 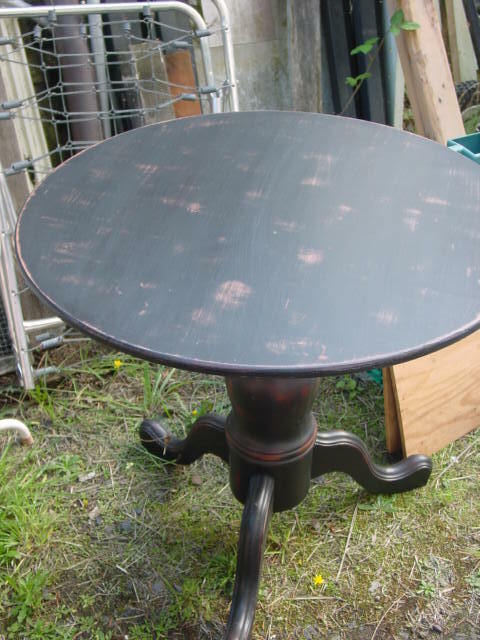 A BIG part of how profitable your business is depends on how much TIME you have to spend refinishing your items. It’s only a GOOD bargain IF you can fix it up in a reasonable amount of time! ‘Good legs’ is something I always look for. This table was made using an old bar stool for the base, (dark green) and an unfinished birch plywood round for the top. 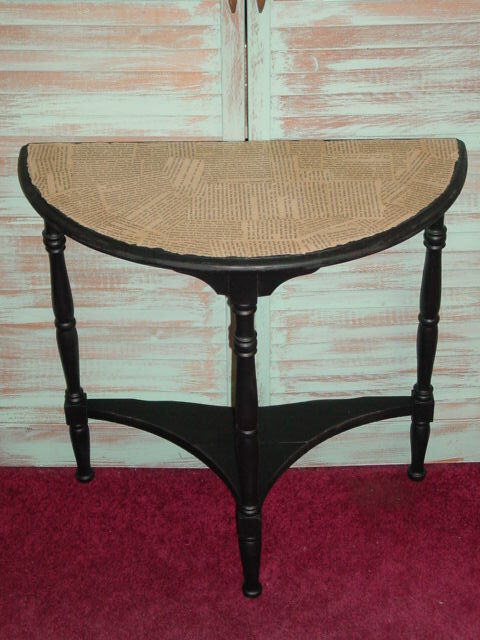 I spray painted the base and top; distressed the top just a tad, around the edges. Then used some tan craft paint to sponge stamp the design on with. I always start in the MIDDLE when doing such a design. Less likely to go crooked when you are only going half way across. I can usually get 3 – 4 imprints from each ‘loading’ on the stamp, so the darkness of the color varies. (which I like to an extent!) then to even out the color a bit, I sand over the whole top before adding a coat of varnish. Most of this black furniture has already sold. I’ll be taking in some new white furniture and Christmas stuff tomorrow. Forgive me if posts are few and far between for the next few weeks. It’s ”CRUNCH TIME” for the upcoming fall show and my to do list is dauntingly long! Don’t forget to enter to win a free year of Country Living magazine in the previous post! I know this post is over a year old, but I was wondering if you still do a Fall Show? If so, which one? Because of my damaged spine and how labor intensive it is to do shows; I no longer do ANY shows.